Jeremiah 1:19 is the second time that God explains to Jeremiah why he need not worry about life’s problems. Dearman says, “As the book will eloquently display, Jeremiah is not immune from human suffering or doubt; his security does not reside in his cleverness or physical stamina, but in the fact that God is with him.” This verse says, “They will fight against you, but they shall not prevail against you, for I am with you, declares the LORD, to deliver you.” Christmas time was the time for celebrating Jesus’ birth. He shall be called Immanuel, which means “God with us” (Matthew 1:23). That’s who Jesus is. God is not only with Jeremiah, God is with us. He is with me! 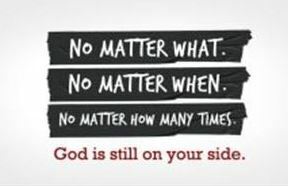 He is with you! J. Andrew Dearman, Jeremiah and Lamentations, The NIV Application Commentary (Grand Rapids, MI: Zondervan Publishing House, 2002), 50. Mark Water, The New Encyclopedia of Christian Quotations (Alresford, Hampshire: John Hunt Publishers Ltd, 2000), 318. C. H. Spurgeon, The Treasury of David: Psalms 56-87, vol. 3 (Bellingham, WA: Logos Bible Software, 2009), 213.